A scientific meeting was held at the N. Louros Conference Center, MITERA Hospital, on November 14, 2017, marking the 25-year anniversary of the HYGEIA Hospital 1st Cardiology Clinic. The meeting, entitled “25 Years of Advancements in Cardiology”, was organized by the 1st Cardiology Clinic, under the auspices of the Scientific Union of HYGEIA Doctors and the Scientific Board. All the HYGEIA cardiology teams participated in the event. The aim of this meeting was to present the major and impressive progress achieved in the diagnosis and treatment of heart conditions over the last 25 years. It was also noted that all these advancements have been successfully adopted and performed at HYGEIA Hospital. Besides, HYGEIA has been paving the way in some of these fields. Cardiologists from all the clinics and interventional/lab departments presented their achievements, each in their own area of expertise. For example, compared to what was the norm 25 years ago, these days acute myocardial infarction is preferably treated with direct angioplasty rather than thrombolysis; the radial access is preferred in coronary angiography; there is the choice of interventional ablation and newer anticoagulants in atrial fibrillation; special pacemakers are implanted in advanced heart failure; and many valve diseases are successfully treated with transcatheter interventions rather than open surgery. In the area of diagnosis, MRIs and new ultrasound techniques provide more accurate diagnosis. During the opening speeches, former Directors Eftychios Voridis and Konstantinos Mallios were honored for their contribution in the establishment and operation of the 1st Cardiology Clinic. Towards the end of the meeting, the Clinic doctors presented some complex medical cases, proving how important it is for different medical specialties to work together. This is one of the advantages HYGEIA has to offer its patients. The meeting was attended by former as well as active hospital physicians from all medical specialties, as well as cardiologists, many of whom have worked at HYGEIA. 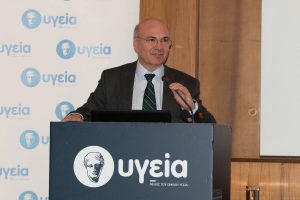 On behalf of the Hellenic Cardiological Society, former President S. Foussas actively participated in the discussion and noted that the scientific level at HYGEIA Hospital was quite high. The feeling at the end of the meeting was that all modern cardiology techniques are performed at HYGEIA Group, with all the hospital cardiologists working closely together.